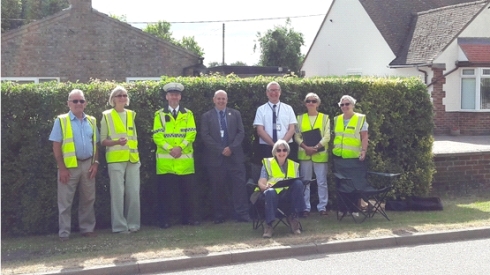 In June our Speedwatch team was joined, for one session, by a PC with responsibility for casualty reduction in Cambridgeshire, the Deputy Police and Crime Commissioner for Cambridgeshire and the County Speedwatch Co-ordinator. There are now 150 Speedwatch teams working throughout Cambridgeshire, each team returns their data on speeding vehicles directly to the Police. Session results are then actioned by the Police. We were pleased to learn that the Police also use the combined data from County teams for a variety of purposes. Please consider joining our team. We would like to recruit 3-4 more volunteers. We aim to go out at least weekly but, you would not have to commit one hour a week every week. It’s just when you have an hour to spare. Training is provided free by the Police. Speed is being monitored here in France. From July 1st the maximum speed on the “routes nationales”- equivalent to UK “A” class roads- will be 80KPH. Any excess will be dealt with by the law, with an appropriate fine. This has no doubt been well publcised in UK, preparing visitors for what’s in store; so my apologies for any repetition. Enjoy your time in France, and drive respecting the law.